A lot has been made recently about the fact that the Democratic advantage in generic ballot polls has narrowed. The tracker at FiveThirtyEight currently shows a lead of only five percentage points, down from thirteen at the end of December. None of that seemed to matter last night in Missouri’s special election for statehouse seats. Democrats have now picked up 35 state legislative seats across the country in special elections to just four for the GOP in the Trump era — and this is the latest deep-red seat they’ve flipped. Republicans won in three other safely red seats. 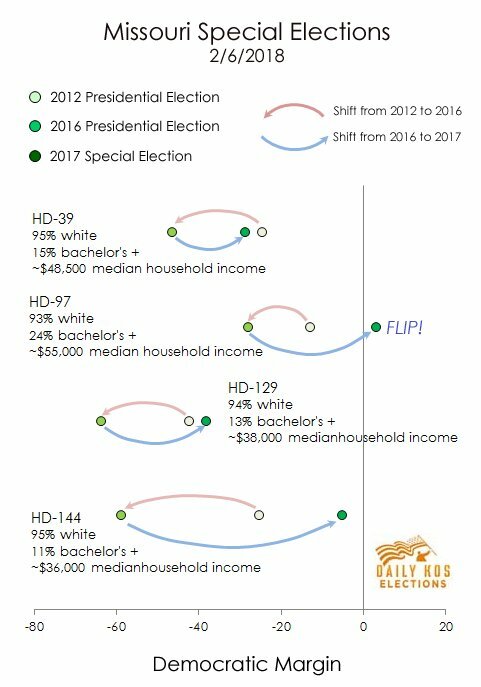 But the folks at Daily Kos Elections produced an interesting graphic to demonstrate how things are shifting. That represents a pattern that has been developing, especially in the center of the country. 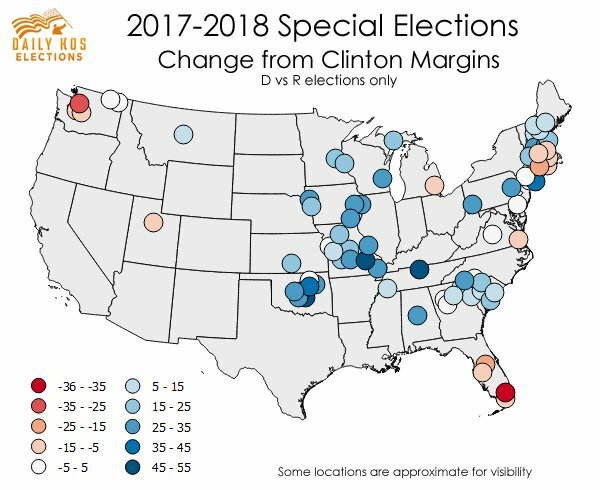 All of those blue dots represent a special election in which the Democratic candidate outperformed Clinton’s margins in 2016. Of course, all caveats apply: turnout in November is bound to be higher than what we’ve seen in special elections. Last night in my home state of Minnesota, turnout was a major disappointment for Republicans. We began our long march towards the midterms with party caucuses. It is important to note that these gatherings don’t play the same role as those you hear about in states like Iowa. Their main function is to begin the process of choosing delegates to regional and state conventions where the parties endorse candidates. That is a whole separate process from the traditional primary, which will be held on August 14th to determine who will be on the ballot in November. With all precincts reporting, almost 11,000 Republicans had participated in the caucus, barely more than half the 20,000 who showed up 2010 and well less than the 14,000 in 2014. On the DFL side, turnout was on its way to 30,000, more than the 22,500 who turned out in 2010, the last time there was an open governor’s race. Almost three times more Democrats braved the sub-zero temperatures up here in the tundra last night to attend the caucuses. I can’t imagine a better test of enthusiasm.